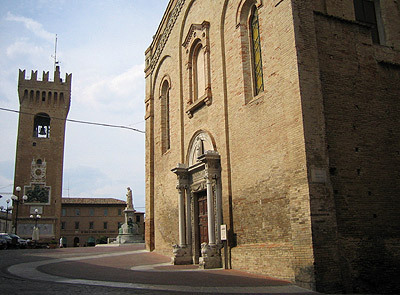 Recanati rises on the top of a hill (296 meters) between the Potenza and Musone rivers' valleys surrounded by a landscape closed between the Sibillini Mounts and the Adriatic Sea. The territory was already inhabited in the ancient times by neolithic populations and subsequently by Picens but the present village rose because of the barbaric invasions that destroyed the Roman city of Helvia Recina, the inhabitants took refuge on the surrounding hills giving origin to the first nuclea of Macerata and Recanati. The present village took its modern aspect in the XII century when three smaller localities were unified: Monte Volpino, Monte San Vito, Monte Morello. It became free Comune and supported the Ghibelline cause being on Federico II of Svevia's side. It passed to the Church remaining inside the Papal State, with the exception of the Napoleonic break, until its annexation to the Reign of Italy in 1860. Recanati for the Italians sounds like Giacomo Leopardi, the great Italian poet who was born here and found the inspiration for some of its more famous lirics (L'Infinito, A Silvia, Il Sabato del Villaggio). To be visited in the village Palazzo Leopardi and its library: 20,000 volumes collected by Monaldo, father of Giacomo. Other interesting spots are the famous hill of the Infinite and the churches of Sant'Agostino (XIII century) with a beautiful portal and San Vito (XVIII).